In addition to speaking on a number of intelligence and national security topics, Ken is willing to provide ‘guest lectures’ for any interested professors during his visit to your campus. This can be finalized when you contact Mr. Stiles. Kenneth L. Stiles, a retired CIA officer with 29 years of experience currently lectures at Virginia Tech for the Hume Center for National Security & Technology [ https://www.hume.vt.edu/ ] and the Department of Geography [ https://geography.vt.edu/department/people/stiles.html ]. Stiles has real-world experience and expertise in intelligence analysis, espionage activities, covert operations, the US war against terrorism, counter-proliferation, foreign relations, US policy maker support, as well as current events and global conflict spots. “Kenneth Stiles is receiving the Career Commendation Medal in recognition of his exceptional achievement during his 29 years of service that substantially contributed to the missions of the Central Intelligence Agency and Intelligence Community,” according to the CIA documentation. Stiles is a recognized expert in Geographic Information Systems (GIS) and geolocation targeting. The CIA and its partners in the U.S. Intelligence Community, a coalition of 17 agencies and organizations, repeatedly sought his expertise for technical targeting and for his ability to operate across organizational boundaries. As a result of his work, he brought new sources and methods to bear in the war on terrorism that directly impacted the success of high risk, high gain technical collection operations saving numerous lives, according to the CIA. His targeting expertise and innovation during the CIA’s operations in Afghanistan in response to the 9/11 attack are chronicled in Henry Crumpton’s book The Art of Intelligence. Kenneth L. Stiles was hired by the CIA in 1984 as an imagery analyst. Additionally, he worked with accounts covering societal issues, the Middle East, information operations, and counterterrorism. He worked in three of the main directorates of the CIA. He also completed tours in Afghanistan, Pakistan, and Europe, and Iraq. Throughout his career with the CIA, Stiles taught individuals from U.S. military personnel to fellow agency officers to foreign liaison analysts. His vast array of experiences and expertise provide a unique and wide-ranging perspective to both students and faculty. The CIA also cited Stiles for his dedication and loyalty to the objectives of the agency. His depth of experience, superior technical skills, creativity, and dedication to duty justly earned the respect and admiration of those with whom he served, reported the CIA. Stiles teaches a course on the history, organization, and function of the CIA within the Intelligence Community, a course on Global Conflict, both based on his experiences while a CIA officer. Both courses are always over-subscribed by student requests. He also teaches a course that shows students how the Intelligence Community uses GIS applications in its analytic targeting to both policy makers and U.S. military forces in the field. 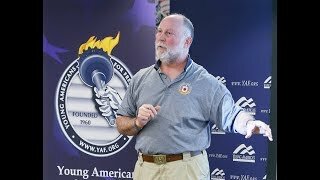 He can also speak about the Second Amendment, being a NRA Life Member, NRA-certified Range Safety Officer, former manager of a US Government Shooting Facility, Concealed Carry Permit Holder, Virginia Citizens Defense League Member, a competitive shooter since 1974, and a hunter since 1989. Stiles has a Bachelor’s of Art degree in History from Randolph-Macon College  and a Master’s Degree in History/Military Studies from Old Dominion University .